Blocks must register w/ RPD and follow the RPD guidelines to win. Blocks must notify HPNA board rep Marsha Mayo to register for competition. Reply to Marsha via NextDoor.com, the HPNA Facebook page, or via our Contact page. given to the winning block for their NNO block party 2017. We encourage multiple block parties and group block parties if you are new to NNO. Contact us and we will try to refer you to a NNO mentor or neighboring block representative. great way to add a layer of security to your home and join our Video Crime Watch program. event feature to let your neighbors know about your NNO party. forward to another successful Richardson National Night Out! September 2016 Yard of the Month! 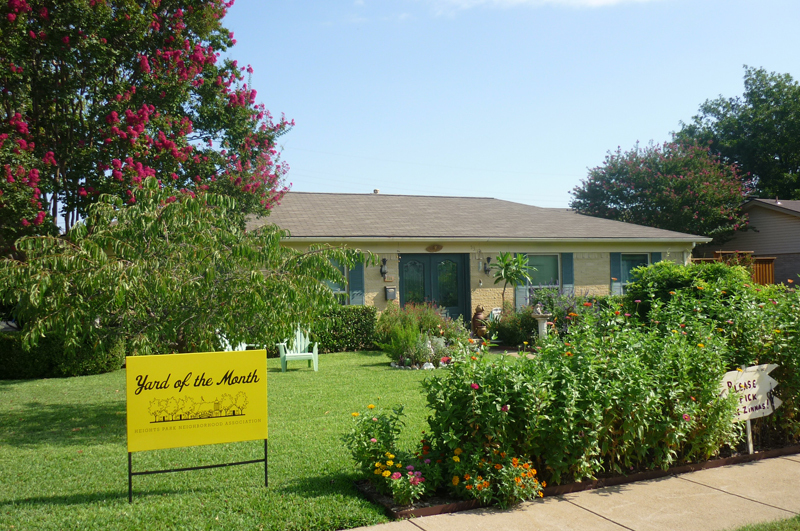 We are very happy to be picked as the Yard of the Month for September. My wife, Nanci has lived here many years in Richardson, but as for me it has been 12 years. We love the Richardson area, and Heights Park community. For the past years I have been improving the landscaping, which has been planting new trees, removing and/or trimming the older ones, working in a new lawn, maintaining the home, a vegetable garden out back and just last year a Zinnia flower bed out front. I have not had the luxury of using a landscaping business due to cost and that I enjoy working outside myself. After working outside for AT&T for 35 years, I am use to a lot of activity. I now have been my own boss as a Disc Jockey (My Music Guy) for almost twelve years and Nanci has her own business as well as a Hypnotherapist for 39 years. Our jobs are flexible which allows me to spend a lot of time in the yard. Last year, we decided to put in the Zinnia flower bed in the front yard. We went to the city with our idea and they affirmed our plan. We wanted to put in a flower bed similar to Nanci’s dad (David Kaplan) did at his house on Hillcrest and Stephanie Road in Dallas. He planted a long raised bed ( longer than mine) full of Zinnias, with a sign “Please pick the Zinnias”. I assume it was a spoof off of the Doris Day movie, “Please Don’t pick the Daises”. The sign would also have scissors hung by string attached, so any one driving by could stop and cut their own Zinnias. We did not get our flower bed in before David passed away at he age of almost 94, but did get it in the next season. I heard the stories of his flower bed and all the cars stopping on Hillcrest while people picked flowers to take to work or to their homes. He even made the Dallas newspaper back then.